Location: South central Cayuga County, Route 38, one mile south of Moravia. 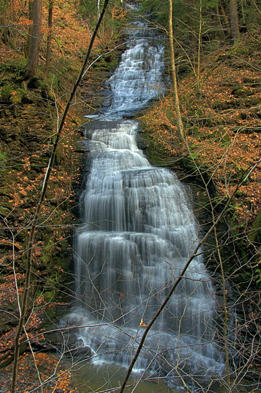 Fillmore Glen State Park was named in honor of Millard Fillmore, who was the 13th President of the United States. He was born in a small log cabin on January 7, 1800, about five miles east of the park. The park features a long narrow gorge with five major waterfalls, and many unique rock formations. The gorge is abundant in its variety of plant life, which inspired Dr. Charles Atwood, an amateur botanist, to work towards establishing the gorge as a public park in 1921. In 1925, ownership was transferred to the state. A campground and stream fed swimming area are located at the western end of the park. The stream is known as Dry Creek, but is sometimes called Fillmore Creek. The Gorge Trail provides access to four of the park’s five major waterfalls. The fifth falls, known as the Upper Falls, is located well off established trails and can not be easily seen. Starting near the swimming area is a short side trail on the northern creek bank. It leads to an area known as the “Cowsheds,” a large recess caused by a protruding ledge of Tully Limestone. A local story says that before the gorge became a park, cows would use this area to escape the heat of summer. Next to the Cowsheds is Cowsheds Falls, sometimes called the Lower Falls. Cowsheds Falls faces to the north, is 37 feet high, and has a curving crest that is 42 feet wide. The base of the falls is a jumble of large limestone boulders. Click here for another photo of Cowsheds Falls. Head back towards the swimming area and cross the bridge over the creek. Follow the Gorge Trail eastwards as it ascends a steep hill and soon enters the gorge above Cowsheds Falls. Continue on the Gorge Trail, crossing the creek several times, and in roughly 3/4 of a mile you will be standing across the gorge from Dalibarda Falls. Found on a tributary of Dry Creek, Dalibarda Falls faces to the southwest. The falls has a crest that is 8 feet wide and a total height of 85 feet. 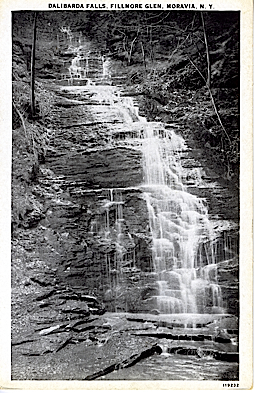 The upper section of the falls is a very steep cascade, while the lower section is nearly vertical. To the left is a photo of Dalibarda Falls taken by David Rice in November of 2010. Apparently the falls is named for a perennial plant in the Rose family Dalibarda repens. Shortly after crossing the creek again you will come to Lower Pinnacle Falls. It faces to the north northwest, has a total drop of 14 feet, and a 22 foot wide crest. Across the creek, and just upstream of the falls, is the Pinnacle. It is a large stone spire that has been separated from the gorge wall by erosion. A short distance past the Pinnacle is Upper Pinnacle Falls. This falls is 14 feet high, has a crest that is 29 feet wide, and faces to the north. Click here for another photo of Upper Pinnacle Falls. From here you can return the way you came or continue on to junctions with the north and south rim trails. You can follow either of these trails downstream (west) to return to the parking area.